The Abbott-Turnbull Government has failed to deliver $355 million that it promised to invest on railways and roads in South Australia over the past three years. Budget papers show the Government undertook to invest $1.44 billion in the State’s infrastructure in its first three Budgets (2014/15 to 2016-17). But Final Budget Outcome documents reveal it actually invested $1.08 billion. The $355 million shortfall indicates the Government has failed to deliver on even its own minimal commitments by failing to roll out projects as promised. The cuts include $233 million from investment in major rail projects and $11.1 million from the program established to fix and upgrade existing bridges. The Government also cut $3.6 million from the important Black Spots road safety program, which upgrades safety at the locations of fatal or serious accidents. Based on the cost of the average Black Spot upgrade, the Government could have upgraded more than 20 dangerous Black Spots if only it had invested what it promised. It also cut $6.2 million from promised investment in the Heavy Vehicle Safety and Productivity Program, which improves safety by providing rest stops and parking areas for trucks. If the money had been delivered as promised it could have been used to deliver the next stage of the North-South corridor project between Pym Street and Regency Road. Completing this missing link will deliver substantial benefits, creating a non-stop 47km corridor from the River Torrens to Gawler, saving up to eight minutes in peak hour traffic. A detailed economic assessment underpinning the project proposal report shows a huge cost-benefit ratio of 7.4:1, and that the project will support 250 South Australian jobs a year until 2022. SA needs increased Federal infrastructure investment to provide jobs and economic activity in the short and medium term, while lifting productivity and road safety standards over the long term. But the Federal Coalition Government has failed to deliver. It makes big-spending promises every Budget, when South Australians are focused on the Treasurer’s Budget speech, but then fails to follow through, apparently hoping no-one will notice. And it gets worse, with Budget Forward Estimates showing Federal infrastructure grants to SA will fall off a cliff in the next four years, from $759 million in 2017-18, to just $95 million in 2020-21. Federal Labor has a record of delivery when it comes to SA infrastructure investment. Over six years the former Labor Federal Government more than doubled per capita infrastructure from $109 per South Australian to $272. New South Wales Government plans to establish the new suburb of South West Creek in Sydney fail to address the most critical ingredient for successful communities – public transport. Planning Minister Anthony Roberts’ announcement of the planned suburb to the south of the new Western Sydney Airport should have been accompanied by a plan connect it to the Sydney rail network. The suburb’s expected 30,000 residents must have access to rail services, particularly people working in new jobs in and around the airport and those working closer to the Sydney CBD. If no rail line is built, the new suburb will be serviced by just one road in and one road out. Without rail, the new development will worsen traffic congestion, which is already eroding Sydney’s quality of life and acting as a hand brake on the city’s economic growth. The new airport has the potential to act as a catalyst for the growth of well paid jobs in Western Sydney. But we must get the planning right. That includes ensuring that there is a clear public transport plan in place before we make ad hoc decisions for new land releases. This north-south line will not only connect the new airport to the passenger rail network from the day it opens, but also make it easier for people to move around within the Western Sydney region. The future of the Survey of Tourist Accommodation remains in doubt after it was revealed at Senate Estimates last night that Minister Ciobo has failed to make any progress in determining its funding. However this is nearly identical to the response provided following the February Senate Estimates this year where, the matter was ‘under consideration by Governments’. The Survey of Tourist Accommodation is heavily relied upon by the tourism sector and considered a valuable resource. It provides information on accommodation across Australia, including occupancy rates, room rates and revenue, as well as a measure of accommodation supply for destinations across the nation. Given that we are now half way through 2017, Minister Ciobo must waste no further time and commit to producing the Survey of Tourist Accommodation. This Government has shown nothing but contempt for the tourism sector, failing to even release a tourism policy at the last election. In this Budget alone, it has cut Tourism Australia’s budget by $35 million over the forward years and increased visa application charges. The fact is that tourism is one of Australia’s super-growth sectors. Communities around Australia rely on tourism for their economies, and so too does the nation. This sector deserves real investment so that it can continue to play a leading role in the national economy. Nationals Leader Warren Truss has today confirmed he and his Liberal Party masters will rip more than $8 billion out of the Federal infrastructure budget, including $2 billion earmarked for projects in Regional Australia, to help pay for Tony Abbott’s promises, including his extravagant, unfair and unaffordable paid parental leave scheme. A full list of regional projects facing the axe is attached below. And consistent with the words of Mr Abbott and the record of the former Howard Government, Mr Truss also reaffirmed that the Liberal and National Parties won’t agree to provide any funding to help fix the nation’s urban public transport infrastructure. 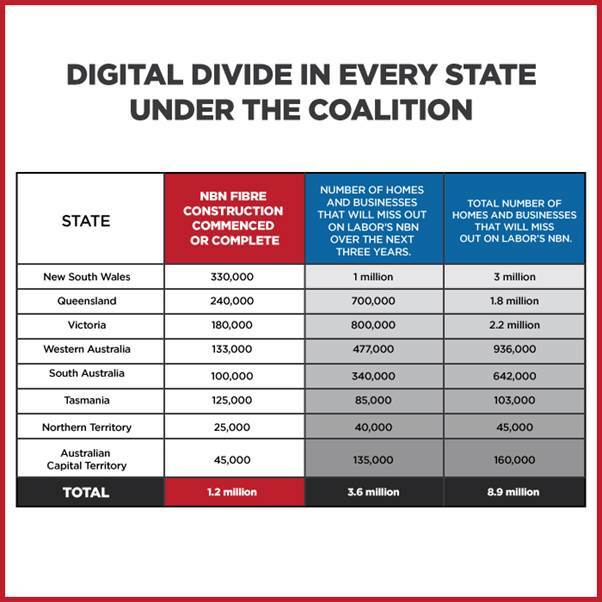 Moreover, they will deny regional communities access to superfast broadband – unless they were prepared to pay as much as $5,000 out of their own pockets to have their homes or businesses connected. During his extraordinary performance at the National Press Club today, Mr Truss made a mockery of the National Party’s ‘guarantee’ of a ‘fair share’ for rural and regional communities. It also explained why for six years he has refused to debate me about our respective infrastructure records and competing plans for the future. Let’s not forget, Mr Truss and the Nationals have form when it comes to failing to deliver for Regional Australia. The last time they were in government, they abolished the entire Department of Regional Development and eliminated all the funding programs associated with it. On top of that they slashed the Federal roads budget by $2 billion, with most OF the cuts falling on regional projects. For our part, the Rudd Labor Government has made sure that regional communities get their fair share, with almost two thirds of our infrastructure funding going to projects outside our cities. In fact, Federal Labor has doubled spending in regional Australia to around $40 billion. In addition, Federal Labor has injected $260 million into building new and upgrading existing regional airport facilities – five times what our predecessors spent. We’ve also made sure regional communities are amongst the first to benefit from the rollout of our National Broadband Network. Since 2007 Federal Labor has delivered the better deal regional communities have long deserved, and if you want good infrastructure for the future, then you’ve got to vote Labor on 7 September. Peak Downs Highway: Straighten and upgrade the Eton Ranges section of the road. Federal contribution: $120 million. Gladstone Port Access Road: Complete this new road link. Federal contribution: $50 million. Replace gravel on poor sections of Arnhem Link Road. Tourle Street Bridge and Cormorant Road Upgrade: Duplicate the bridge and the approaches to it. Federal contribution: $52 million. New England Highway: Realign the three kilometre Bolivia Hill section. Federal contribution: $80 million. New England Highway: Fix congestion and safety issues around the level crossing in Scone. Federal contribution: $45 million. Mt Ousley upgrades: Construct two new northbound and two new southbound climbing lanes on Mt Ousley Road between Bulli Tops and Picton Road interchange. Federal contribution: $42 million. Olympic Highway: Replace the existing Kapooka Bridge and the approaches to it. Federal contribution: $19.5 million. Newell Highway: Install additional overtaking lanes. Federal contribution: $5 million. Ballarat Freight Hub: Develop a general freight centre in the Ballarat West Employment Zone. Federal contribution: $9.1 million. Princes Highway West: Duplicate the Winchelsea to Colac section. Federal contribution: $257.5 million. Anangu Pitjanjatjara Yankunytjatjara (APY) Lands: Upgrade sections of the main access road between the Stuart Highway and Pukatja, as well as 21 kilometres of community roads. Federal contribution: $85 million. Midland Highway Upgrade: Package of works, which includes duplication of the section between Perth and Breadalbane; dedicated upgrades at Mona Vale, St Peters Pass and between Mangalore and Bagdad; and planning for a future Launceston Bypass. Federal contribution: $500 million over ten years, with the Coalition having committed only $400 million. Freight Rail Revitalisation: Continuing upgrade of the network including replacing approximately 290 kilometres of old track. Federal contribution: $119.6 million. Huon Highway: Upgrade the intersection with Summerleas Road. Federal contribution: $17.5 million. Channel Highway: Upgrade and widen road near Huonville, as well as build new link roads and erect a new bridge over Skinners Creek. Federal contribution: $7.5 million. Great Northern Highway: Package of works along the Muchea to Wubin section, including realignment work, intersection upgrades, road widening and additional overtaking lanes. Federal contribution: $307.8 million. North West Coastal Highway: Package of works between Minilya and Barradale, include widening and strengthening the road as well as erecting two new bridges. Federal contribution: $174 million. Funding for all these projects are already included in the Budget. Opposition Leader Tony Abbott and his sidekick, Shadow Infrastructure and Transport Minister Warren Truss, are truly shameless – having spent the last four years criticised Federal Labor’s approach to building the Inland Rail Link, they have today adopted it lock, stock and barrel. The Liberals and Nationals have committed exactly the same amount of funding, adopted exactly the same route and signed up to exactly the same construction time-table as first announced by us back in 2010. In fact they have ditched their earlier promises to have the line up and running by 2020. And let’s not forget they have form. The former Howard Government, in which Mr Truss served as Transport Minister, had twelve years to build this rail line but instead they chose to do nothing, except establish committees and commission one study after another. What’s more, today’s extraordinary backflip doesn’t conceal the fact they will rip billions out of rail projects nationwide: Brisbane’s Cross River Rail, Melbourne Metro, a light rail network through Perth’s northern suburbs and a new rail line to its airport, and the Tonsley Rail Line Upgrade in Adelaide. But Tony Abbott’s axe won’t just fall on urban passenger rail. He’s also refused to commit to a number of freight rail projects such as the next stage in the revitalisation of Tasmania’s rail network – a $119.6 million capital works program which will replace some 290 kilometres of old tracks – as well as the upgrade of the lines into and out Port Botany. So if you value rail and want to see these projects, as well as the Inland Rail Link built, then you’ve got to vote Labor on 7 September. Only Federal Labor has a long term plan to get more freight AND people off our roads and onto rail. Already we’ve rebuilt over a third of the Interstate Rail Freight Network and committed more funding to urban public transport than all our predecessors since Federation combined. Once operational, the new 1,731 kilometre Inland Rail Link via the NSW Central West will cut up to 7 hours off the journey times between Brisbane and Melbourne, take trucks off our highways, ease the growing congestion on the existing coastal line through Sydney and open up new economic opportunities for many inland communities. A re-elected Rudd Labor Government will prioritise completing the necessary preparations so construction of the remaining sections of the Inland Rail Link can commence as soon as possible, with further detailed planning, environmental assessments, and land acquisitions to begin within twelve months. Already we have done much to progress this vital project. Over the past five years, we have invested almost $600 million rebuilding the existing track that will eventually form around 60 per cent of the final Inland Rail link, including upgrades around Melbourne, Albury, Cootamundra and Parkes. The additional pre-construction work along the rest of the corridor will be funded from the $300 million set aside in the Budget’s Forward Estimates. Once operational, this new 1,731 kilometre line connecting Brisbane to Melbourne via the NSW Central West will cut up to seven hours off the time it takes to transport freight between these two capital cities. It will also take trucks off our highways, ease the growing congestion along the existing coastal line through Sydney, and open up new economic opportunities for inland communities such as Toowoomba, Moree, Narromine, Parkes, Wagga Wagga and Albury. First conceived more than a century ago, it took the election of Federal Labor in late 2007 to breathe life into the project. We are the first ever national government to commit to building this new rail line with real money to make it happen. By comparison, my National Party predecessors in the former Howard Government made an art form out of inaction. They never committed any money for construction nor upgrade or laid one metre of track. If you value rail and want to see this nation building project completed, then you’ve got to vote Labor. When it comes to rail infrastructure, Labor always delivers more than the Liberal and National Parties. From the outset, the modernisation of the Interstate Rail Freight Network has been central to this Federal Labor Government’s broader efforts to lift national productivity, reduce harmful carbon pollution, and get more freight off our highways and onto the back of trains. Beyond the Inland Rail project, Federal Labor has invested billions rebuilding more than a third of the Network – or almost 4,000 kilometres of track. In fact it has been the most extensive upgrade in almost a century, involving 52 major projects across the country. This week the Liberal and National Parties confirmed they will slash funding for Victorian road, rail and public transport projects by almost $3.9 billion to help pay for Tony Abbott’s promises, including his extravagant, unfair and unaffordable paid parental leave scheme. Indeed, this funding is the latest victim of the Coalition’s desperate search for ways to fill the more than $70 billion hole in their election costings, confirming that if Tony Abbott wins Victoria’s infrastructure will be the loser. Melbourne Metro: Constructing a new underground rail line from west of South Kensington to east of South Yarra, increasing capacity on the entire network (Federal Labor’s contribution: $3 billion). M80 (Western and Metropolitan Ring Roads): Upgrading a further 38 kilometres of these roads and install an Intelligent Transport System along the whole corridor (Federal Labor’s contribution: $525.1 million). Managed Motorways: Upgrading the Intelligent Transport System along the Monash Freeway from High Street to Warrigal Road and from Warrigal Road to Clyde Road, including new sensors and Variable Speed Signs (Federal Labor’s contribution: $77.7 million). Ballarat Freight Hub: Developing a general freight centre in the City’s West Employment Zone (Federal Labor’s contribution: $9.1 million). Princes Highway West: Duplicating the section between Winchelsea and Colac (Federal Labor’s contribution: $257.5 million). A full list of projects facing the axe nationwide is below. Ripping billions of dollars out of the infrastructure budget and cancelling major projects when we should be tackling urban congestion, building stronger regions and preparing our nation for the post-mining boom era would be an act of economic vandalism. Let’s not forget the Coalition has form. When last in government they slashed road funding by $2 billion, starved rail of much needed new investment and refused to commit anything to fixing our urban public transport infrastructure. By contrast, under this Federal Labor Government, Australia has gone from 20th to 2nd amongst major advanced economies when it comes to infrastructure spending as a proportion of national income. Here in Victoria we have nearly tripled annual spending from $68 to $183 per person. Only Federal Labor has a positive vision and clear plan to build Victoria’s future. Brisbane Cross River Rail: Construct a new tunnel between Yeerongpilly Station and Victoria Park as well as four new underground stations. Federal contribution: $715 million. Warrego Highway Upgrade: Package of works between Toowoomba and Miles. Federal contribution: $317.5 million. Gladstone Port Access Road: Completing this new road link. Federal contribution: $50 million. F3 Productivity Package: Widen the F3 from Tuggerah and Doyalson and from Kariong to Somersby as well as upgrade the Kariong Interchange and the Weakleys Drive intersection. Federal contribution: $195.8 million. Port Botany Rail Link Upgrade: Remove the level crossing at the General Holmes Drive by constructing a road underpass. Federal contribution: $40 million. Port Botany Rail Line Upgrade: Upgrade the line to improve access and connectivity between the Port and the future Moorebank Intermodal Terminal. Federal contribution $75 million. Melbourne Metro: Construct a new underground rail line from west of South Kensington to east of South Yarra to increase capacity on the entire network. Federal contribution: $3 billion. o Plenty Road to Greensborough Highway. Federal contribution: $525.1 million. Managed Motorways: Upgrade the Intelligent Transport System on section of the Monash Freeway between High Street and Warrigal Road, including additional sensors and Variable Speed Signs to help improve traffic flow. Federal contribution: $9.9 million. Managed Motorways: Upgrade the Intelligent Transport System along the Monash Freeway between Warrigal Road and Clyde Road, including additional sensors and more Variable Speed Signs to improve traffic flow. Federal contribution: $68.6 million. Princes Highway West: Duplicate the section between Winchelsea and Colac. Federal contribution: $257.5 million. South Road: Upgrade and widen the Torrens Road and the River Torrens section, including sinking 1.4 kilometres of the road below surface as well as constructing two new interchanges and a rail overpass. Federal contribution: $448 million. Managed Motorways: Install an Advanced Traffic Management System along the South Eastern Freeway between Stirling and Mount Barker, including new variable speed limit and message signs. Federal contribution: $8.0 million. Managed Motorways: Install an Intelligent Transport System along the South Eastern Freeway between Crafers and Stirling. Federal contribution: $4.5 million. Tonsley Park Public Transport Project: Upgrade of the public transport infrastructure in and around Tonsley Park, including duplicating a section of the Tonsley Rail Line as well as upgrading Clovelly Park and Tonsley stations with new park-and-ride facilities and bus interchanges. Federal contribution: $31.5 million. Midland Highway Upgrade: Package of works, which includes duplication of the section between Perth and Breadalbane; dedicated upgrades at Mona Vale, St Peters Pass and between Mangalore and Bagdad; and planning for a future Launceston Bypass. Federal contribution: $500 million over ten years, with the Coalition having committed only $400 million – an amount Tony Abbott has finally conceded won’t be enough to fully duplicate the road. Brooker Highway: Address congestion and access issues at the intersections with Goodwood and Elwick Roads as well as replace the existing Howard Road roundabout with traffic lights. Federal contribution: $25.6 million. Tasman Highway Ramps: Install new on and off ramps at the intersection with the East Derwent Highway. Federal contribution: $13 million. Tonkin Highway: Build three new interchanges at the intersections with Benara Road, Morley Drive and Collier Road. Federal contribution: $140.6 million. Leach Highway: Widen and straighten High Street in Fremantle between Carrington Street and Stirling Highway. Federal contribution: $59 million. Perth Public Transport Package: Assist in building a light rail network through the City’s northern suburbs and/or a new rail line to Perth Airport. Federal contribution: $500 million over ten years. From the start of the next AFL finals series, football fans at Etihad Stadium will be able to enjoy superfast internet access turbocharged by the Rudd Labor Government’s National Broadband Network (NBN). A re-elected Rudd Labor Government would fast track the rollout of the NBN to Etihad Stadium as a pilot project that in an Australian first, will allow the AFL to deliver wi-fi internet to football fans. Using the capacity of NBN, the AFL will deploy wi-fi hotspots for fans to connect to fast broadband using mobile devices like smartphones and tablets. The NBN rollout to Etihad Stadium will be the first stage of the AFL’s national fibre and wireless strategy, that will ultimately incorporate all major AFL venues as the NBN rolls out across Australia. This is an exciting development for both the code and the fans and will be a game-changer in how fans can experience the sport. Sports fans want to get online in different ways – through their mobiles, tablets, desktops and smart TVs, and we need to keep pace with a changing world. As part of the pilot, the AFL’s Docklands Headquarters will be connected to the NBN and the AFL will be an early trial customer of NBN Co’s enterprise grade broadband product, capable of providing 1,000 mbps download and 1,000 mbps upload speeds, ahead of its commercial release in 2015. Getting online at the footy through a smart phone or tablet is becoming as natural as barracking for your team. Federal Labor’s NBN will turbocharge wireless devices through wi-fi connections whether at home, at work, or at the footy, avoiding the frustration sometimes experienced at major events where congestion on mobile networks can make connecting to the web unreliable and slow. The Rudd Labor Government’s NBN is being rolled out to all Australian homes and businesses, as well as schools, hospitals, nursing homes and sporting stadiums. It is delivering benefits across all sectors of the economy, including education, health, small business, agriculture, and sporting organisations. Over the next three years, the NBN’s fibre network will have construction completed or commenced to over 4.8 million premises all over Australia. Federal Labor’s NBN is an investment in our nation’s future prosperity. It will transform the way we live our lives, do our business, grow our regions and engage with the rest of world. Australians now face a clear choice: they can vote for the future with fibre under Federal Labor, or the past with copper under the Coalition. Australia will be divided into broadband haves and have nots if the Rudd Labor Government is not re-elected at next month’s federal election. Tony Abbott and Malcolm Turnbull would wreck Federal Labor’s National Broadband Network (NBN), denying millions of Australians access to the boundless educational, health, lifestyle and commercial opportunities this essential infrastructure delivers. Right now, construction on the NBN’s fibre network has commenced or is complete for 1.2 million homes and businesses across the country. If there’s a change of government on 7 September, that is where the fibre rollout will stop. Areas to miss out on superfast fibre broadband under the Coalition include 3.6 million homes and businesses currently scheduled to get NBN fibre, including Shellharbour, Alice Springs, Bendigo, Broome, Burnie, Mount Gambier and Maroochydore, as well as all suburbs in the one and three year rollout plans in every town and city across Australia. They will be left with one of two choices: battle on using last century’s copper, or fork out as much as $5,000 to have fibre connected to their home or business – something others will get for free under Labor’s NBN. However, if the Rudd Labor Government is re-elected the roll out of fibre-to-the-premise will continue, delivering world class broadband infrastructure for all families and businesses in Australia. Tony Abbott will cut down the NBN, dividing the country between broadband haves and broadband have nots. If Tony Abbott and the Coalition win on 7 September, Australians will lose.